JEE Main 2017 result jeemain.nic.in / cbseresults.nic.in has declared the JEE Mains result 2017. JEE exams were conducted for JEE mains 2017 on April 2 (offline) and April 8 & 9 (online). The entrance examination is often known as the largest undergraduate engineering examination for entrance in prestigious IIT (Indian Institute of Technology). The fact that IIT students controlling many top multi-national companies usually lures the students to get admission in the first go. Governing body have decided to release the result on 27th of May along with the All India Ranks. Candidates securing top ranks will be placed directly to one among the best colleges in India. However, Many students will not secure good rank but at the same time, they will get qualified for the second phase of entrance test. Students qualified in JEE mains for placement in a particular institute will no longer need to appear in any of the following examinations/ tests. As per the notification released last year, CBSE Class 12th marks shall not have any weightage in computing the actual ranks this year. Candidates selected on basis of rank and interview will be placed in UG engineering / architecture courses at the NITs, IIITs, and GFTIs accordingly. While some universities score high points for admission criteria, some have linen selection process. Among the all three top engineering institutions in India, it’s hardest to get selected in IITs. JEE have earlier released the answer key for Mains Examination on 18th of April which gave us an approximate count of a predictable qualification marks this year. This year, the terms didn’t went too much well for every category of students as the board restricted selection of students scoring more than 75% (65% for reserved category) in the class 12th examinations for IITs, NITs and GFTIs who follows common conduct of counselling through JoSAA (Joint Seat Allocation Authority). JEE main 2017 result will decide the fortune of students to get admission in different institutes of India which includes institutes of national importance. The total number of students registered for the examinations in 2017 were 1,198,989 which is almost twice the population of entire Washington DC. Most of the students in rural areas opted for pen and paper examinations, according to reports. The total number of students appeared in the pen-paper examination were 10,15,349. While only 183640 students opted for the computer based examinations. The main reason for students opting pen-paper examination was the last year’s result. Along with 3,36,460 female candidates and 8,62,526 male candidates, there are 3 transgender candidates as well this year who are waiting for Jee Results 2017. There shall be no weightage for the 12th class marks in calculating the JEE main 2017 result and ranks. Hence no counting of 12th CBSE marks. For the candidates to qualify for the admission in the IITs/NITs/IIITs and such other CFTIs whose admissions are based on the JEE (Advanced)/JEE (Main) ranks, they should have secured at least 75% marks in the 12th class examination, or be in the top 20 percentile in the 12th class examination conducted by the respective Boards. For SC/ST students the qualifying marks would be 65% in the 12th class examination. 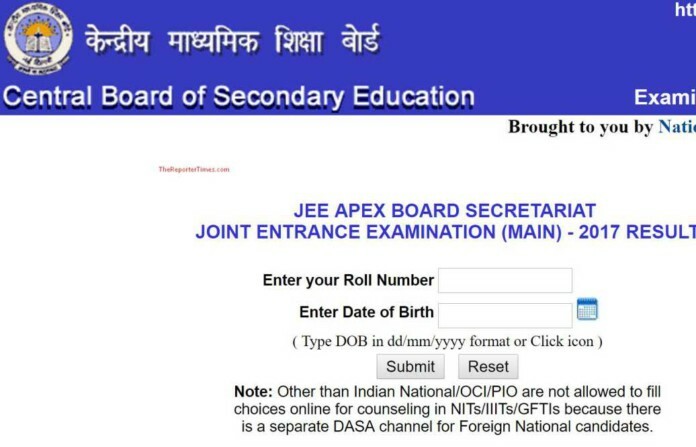 The States of Madhya Pradesh, Haryana, Uttrakhand, Nagaland, Odisha & some other institutions have joined JEE (Main) system, however, their admission criteria will be notified by the concerned authorities. 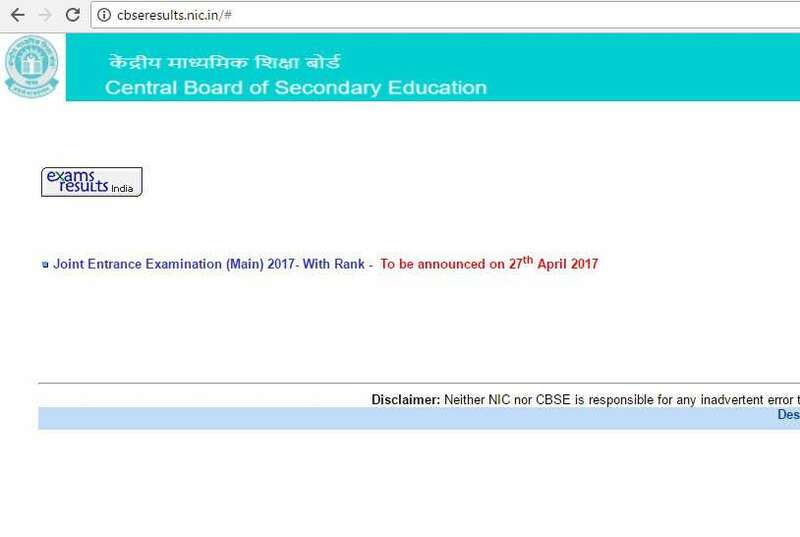 JEE Mains Result 2017 shall be released by CBSE (Central Board of Secondary Education). The institute holds up the sole responsibility of declaring the results every year for all type of candidates. This year, the result is scheduled to be declared on 27th of April on the official website of the institute. JEE Mains 2017 result can be accessed online and offline as well on the given day. Scores in each of the subject set will also be published along. Along with the marks, it shall also be displayed whether you qualified for the forthcoming JEE advanced examinations or not. It’s very much certain from the institute that they are sending results separately to candidates. Over the past years, Central Board of Secondary education had made it simple to download and take print out of the given result. Only the applicants can watch the result because of additional security for psychological pressure on the students. Click on the link which will be directed you to the official result checking website. The link will be released on 27th of April 11 AM on this page. Enter the basic details including roll number and date of birth of candidates. Click on submit button and result will be displayed in a couple of seconds. However, it’s very much certain that website of the institute may go down on the very day so use automatic loader developed by our website. Click submit button after entering roll no. and date of birth. The result will be displayed on the following page. You will also be able to check the subject wise score and JEE 2017 rank of you. Download rank card for future use or take a screenshot. Along with the JEE main 2017 result, your qualification status for JEE Advanced 2017 shall also be displayed on the same page which will highlight whether you qualified or not for the further examinations. Because of physical limitations, the institute cannot release the result of each and every candidate on their offices. It’s advisable to check result through online ways itself. Cut-off for CML (Common Merit List) in 2013, 2014, 2015, 2016 was 113,115,105,100 respectively. Cut-off this year is going to be high around 115. All the best for your JEE main 2017 result. JEE Main 2017 Result Declared …!!!! Discuss your Marks & Ranks with us for admission guidance in top colleges.